If you wish to pick cow parsley to eat, you really should know the difference between it and hemlock. Cow parsley is edible and good. However once you have spotted the differences, you are unlikely to mistake the two. 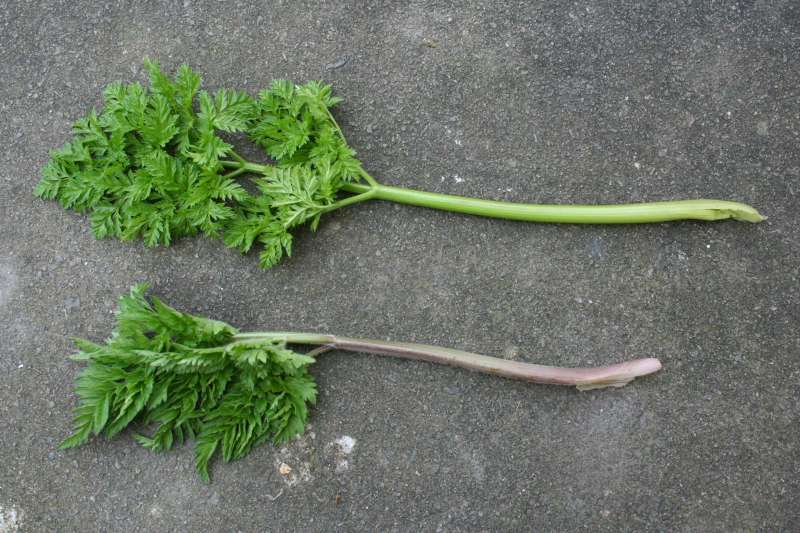 The photo below shows the young leaves of the two, at the time of year when you may be tempted to eat cow parsley. They grow at the same time and often in close proximity! Hemlock Above: the young stems are round and show no groove. They are bright green and glabrous (hairless). The leaves are more finely divided than those of cow parsley. As the stems get older they show a tendency to develop distinct red/brown spots. I suppose the main indicator is the smell: crush hemlock and it emits a strong and unpleasant smell! Cow parsley Below: the young tender leaves tend to have pink stems.They are grooved, rather like celery, where they would clasp the main stem (if one were present). The leaves are a slightly bluer green and not as finely divided as hemlock. Also cow parsley is slightly hairy. Crushed, it also has a smell, but not unpleasant! The pictures below show whole plants. All were taken on the same day (13th March 2009) in the same place (the fen road between Reach and Upware) so lighting and growth conditions are very similar. Page first published 13th March 2009.